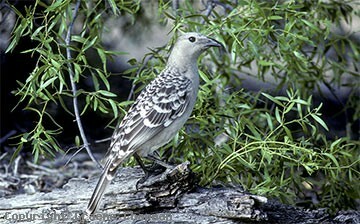 The Great Bowerbird occurs across tropical northern Australia south to around 20 degrees Lat. and on the east coast to the vicinity of St Lawrence. It is a common bird in many areas and a familiar sight around human habitation in some northern towns where the distinctive bowers are built sometimes in back yards and gardens. In the wild they feed on fruits (figs are a favourite), flowers, nectar and seeds but in urban areas they can be more omnivorus and even eat bread and scraps. 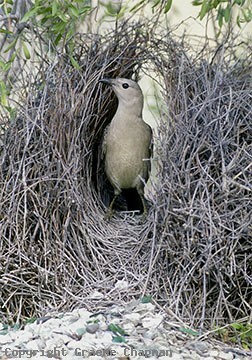 Great Bowerbirds also build great bowers! They are substantial structures when compared to those of our other avenue builders. Quite a large stick platform is built as a base for the walls of the bower, but the feature that stands out is the large collection of pale coloured bones, stones and shells used as decorations. Coloured (often red) and shiny objects are also employed and birds that build near habitation have been known to collect precious things, such as car keys! Bowers are sited in much the same place from year to year - often the old one is simply refurbished but sometimes a new one may be constructed nearby. There are actually cases of bowers being found in much the same place for at least 50 years. Males are known to spend around half the day attending the bower in the breeding season where they may court several females. At this time they utter a wide range of harsh, grating calls but they are also excellent mimics and have even been known to mimic dogs and cats. 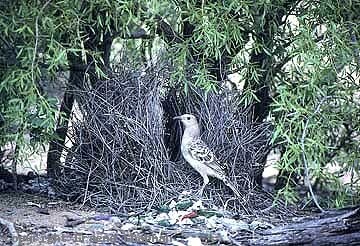 Great Bowerbirds and Spotted Bowerbirds occasionally overlap in range. 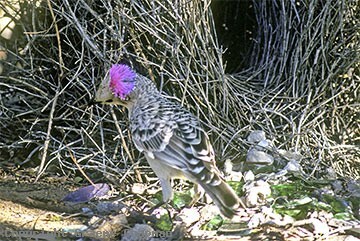 Clifford and Dawn Frith in their excellent book "Bowerbirds" cite an instance of hybridization in the Charters Towers district of Queensland and also show a photograph of a Spotted Bowerbird attending the bower of a Great. 683001 ... Great Bowerbird, male at bower.